Play List: Blackdiamond’s Metal Christmas Mayhem Last Show Of 2016! Blackdiamond’s Metal Mayhem‘s last show of 2016 was on Tuesday 20th December. The show, as always started at 6PM GMT on http://www.totalrock.com, and celebrated the holiday season with a few metal Christmas songs in between some favourite releases from the year, from bands such as AVANTASIA, LORDS OF BLACK, EVIL MASQUERADE, MYRATH, PITCH BLACK PROCESS and many more! Also featured on the show were some end of the year new singles from KREATOR, BATTLE BEAST and SEPULTURA along with a very special track only released on video until the new album next year, the epic new Yuletide offering from SNOWY SHAW – ‘Krampus’! Check out the full play list below, now available to listen to again at this location. This entry was posted in Radio Shows and tagged Blackdiamond's Metal Mayhem, Christmas 2016, Snowy Shaw, TotalRock. Bookmark the permalink. 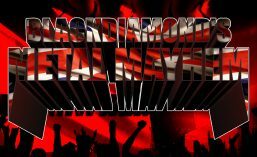 ← Blackdiamond’s Metal Christmas Mayhem: Last Show Of 2016!